Townsville is a city on the northern east coast of Queensland. 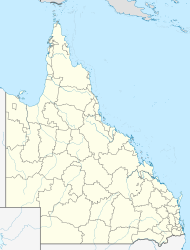 It is the largest regional city in Queensland and in 2010 was made a second capital by Premier Anna Bligh to take the stress of governing off the southeast corner of Queensland. Before the city was made a capital, Townsville was often referred to as the capital of North Queensland, but the split of the state never occurred. Popular attractions include 'The Strand', a long tropical beach and garden strip; Riverway, a riverfront parkland attraction on the banks of Ross River; Reef HQ, a large tropical aquarium holding many of the Great Barrier Reef's native flora and fauna; the Museum of Tropical Queensland, built around a display of relics from the sunken British warship HMS Pandora; and Magnetic Island, a large neighbouring island, the vast majority of which is national park. English explorer James Cook, went by the area where Townsville was established in 1770, but did not land. Townsville City was established in 1863 by English explorer Robert Towns to build a new port for Australia. Since then Townsville grew into a livable city as people began moving to up to the city. During WWII Townsville was used by the Americans as a military base. There were many airbases, bunkers, tunnels and fortifications around Townsville, some of these forts are still visible, where as others have been demolished. Townsville was once referred to as Australia's Saviour, but this slowly faded away as history from the war in Townsville was destroyed to hide tunnels from the public. On Christmas Eve in 1971, Townsville was hit by Tropical Cyclone Althea, which destroyed the port almost completely. In 1982 Flinders Street in the CBD was closed to traffic and turned into a shopping mall. The Strand Beach was redeveloped into a tropical beach park with features such as a waterpark, the rockpool, and the War Museum. ↑ "3218.0 – Regional Population Growth, Australia, 2014–15: Population Estimates by Significant Urban Area, 2005 to 2015". Australian Bureau of Statistics. Australian Bureau of Statistics. 30 March 2016. Retrieved 9 April 2016. Estimated resident population, 30 June 2015. ↑ "2011 Census Community Profiles: Townsville". ABS Census. Australian Bureau of Statistics. Retrieved 15 September 2016. This page was last changed on 25 January 2018, at 17:33.